Since I finished the Hat Yai posts like finally, I think it's time for me to blog more about Penang food again; didn't went to much cafes or restaurants nowadays, as we are giving ourselves some budget each month for that, means more saving for us! Good thing I would say. 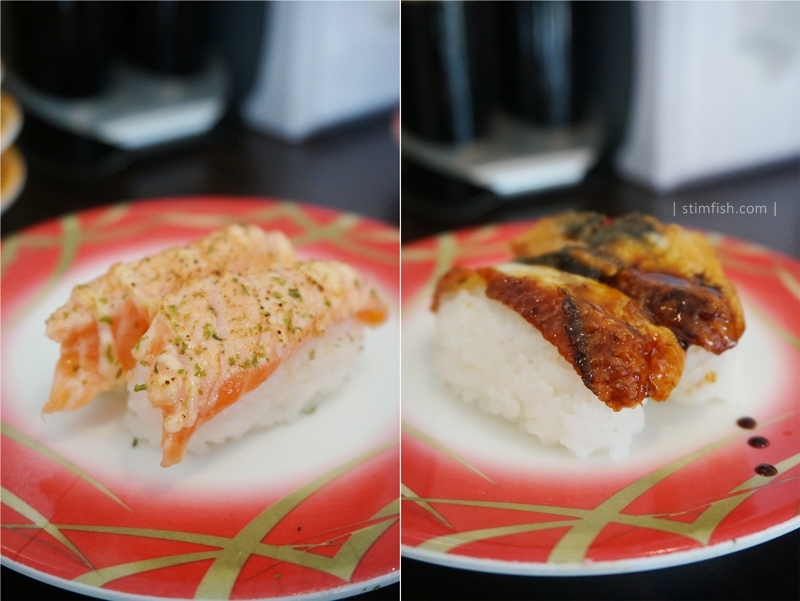 Like what I mentioned in previous post, BenDan and I went to have our lunch at the Sushi Mentai which gone viral among Penangites. We were thinking to reach the restaurant half hour after the opening hour, so we wouldn't wait too long for our seats; but we were so wrong. We passed by the restaurant while looking for the parking, I decided to queue in front the restaurant after seeing the crowd while BenDan continue to look for a parking. I must say that there is no waiter or waitress outside the restaurant to control the crowd, I also have no idea where to get the queuing number until I saw the not-so-obvious handwritten paper on the door; this should be improved. It will be better if you are coming here with lesser friends, it means you will get your seats faster than those in big group. We got our seats in half hour time while the big group was still waiting until more diners were leaving the restaurant. The first impression when I saw the interior: packed, small and noisy, hopefully the situation will become better after the crowd is lessen. Since the sushi price is only selling at RM1.80 and RM2.80 (after GST will be RM1.91 and RM2.97), so we decided not to order ala carte menu except for the temaki hand roll. Something I don't like is I saw flies in the restaurant, which is quite annoying and make me doubt on the cleanliness of the restaurant. 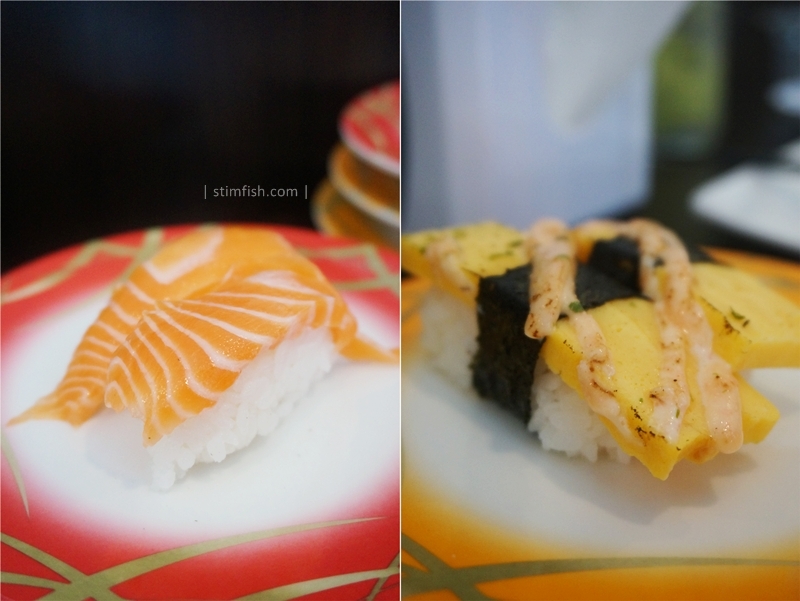 I just took some of the sushi photos, and we only had 9 red plates (RM2.80) and 6 yellow plates (RM1.80) which is quite less if compare to others. We did asked is it okay to place order for the sushi, but the answer given is NO; they can't take the order at this moment as the crowd is too much and they can't handle it. It means we can only sit there and wait for the sushi to be served on the conveyor belt, I remember we sat there for 10 minutes just to wait for the unagi sushi. Sigh. 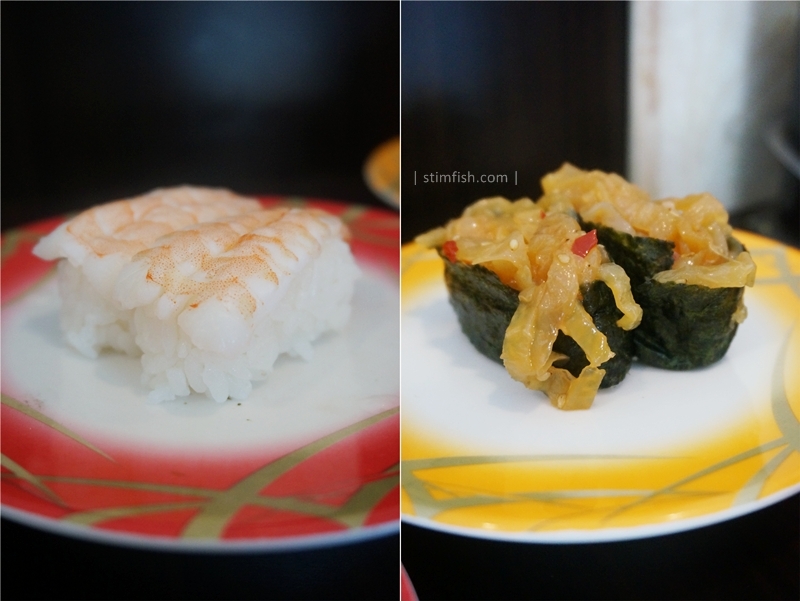 The quality of the sushi is just moderate, which is worth to the price we are paying, so no complain except the flies. We happened to passed by the restaurant when we were dining in another restaurant at Elit Avenue, the crowd is lesser and I think it will be the best time for you or me to visit again. Till then. 1-1-33A, Jalan Mayang Pasir 3, Elit Avenue, 11950 Bayan Lepas, Penang.